As evidenced by last week’s posts, it’s clear that I have a strong addiction to plaid this season. Old Navy has dozens of different colors & styles of plaid right now – I had a seriously hard time not coming home with every single piece I tried on! Today I’m showing you 3 different ways to incorporate plaid into your fall & winter wardrobe – so whether you prefer just a touch of this classic print or you want to make a real statement, there’s something here for everyone. 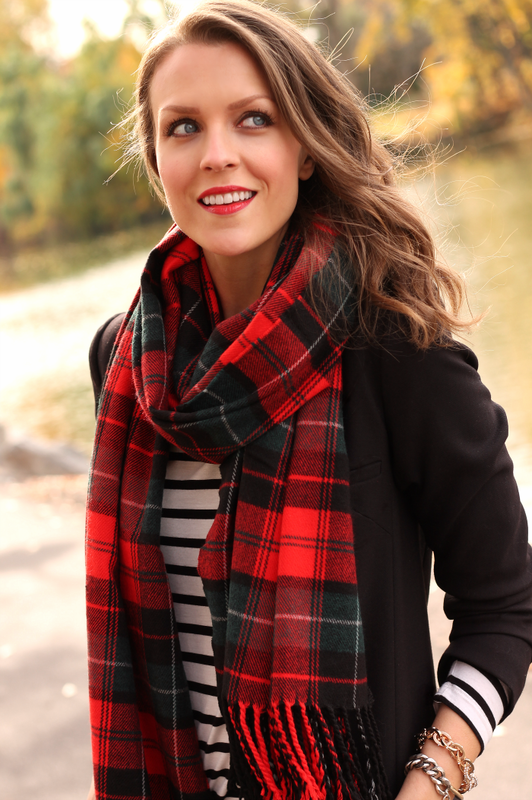 If you haven’t yet embraced plaid, now is the perfect time because every single Old Navy piece I’m wearing here is currently on sale + you can get 25% off your online order today! Don’t be afraid to mix other prints with your plaid! Stripes are always a favorite of mine because they are a playful way to combine without going over-the-top. My no-fail tip for pulling it off? Make sure both prints have at least one color in common (in this case, it’s black) – this helps your mixing come off as more polished & intentional. 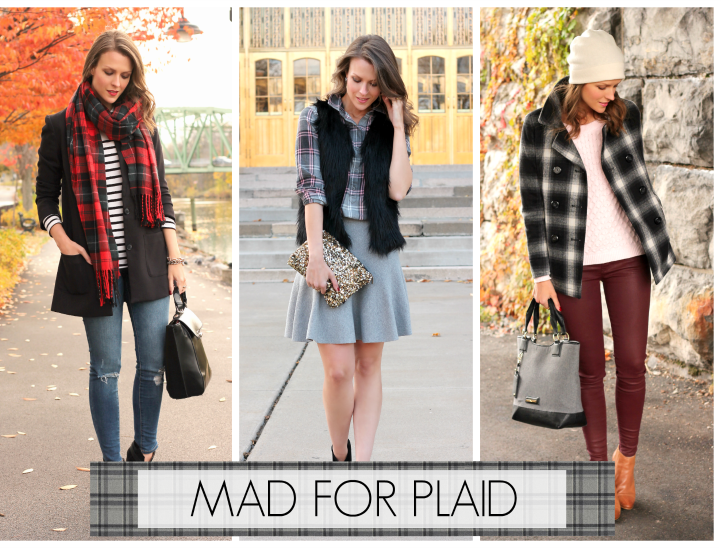 Who says plaid has to be reserved only for daytime? 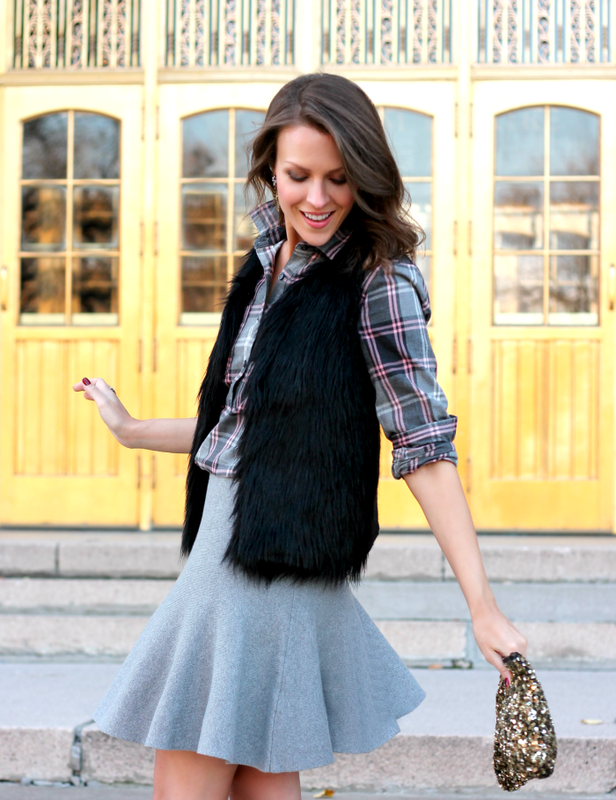 Take a cozy flannel shirt into evening by adding some glam with a chic faux fur vest, a flirty skirt & a dash of sparkle. With all those holiday events right around the corner, this is a perfectly festive pairing for hosting or attending a party. 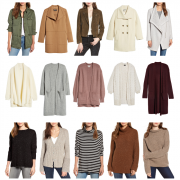 Go all out with a statement coat. 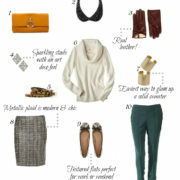 This plaid outerwear is more versatile than you’d expect because the colors are soft neutrals. The pea coat details make this a modern take on a classic staple – great for layering over jeans & sweaters for a cozy day look.